Have you ever felt that your coaching business isn’t flowing as smoothly as it should? If so, it could mean that you need to dig a bit deeper into your business mission and get it even more in tune with your divine purpose here on earth. Just imagine how your life and business will thrive when your business is totally congruent with your life’s purpose! This episode of Coach Pep Talk will help you understand and tap into your life’s purpose and translate that into business success. If that sounds good to you, I invite you to listen to the amazing discussion I had with the very talented coach/author/speaker, Nicola Grace, on finding your divine coaching mission. Benay: [00:00:00] Welcome back to another episode of Coach Pep Talk. The podcast for people who run their own coaching businesses. Each week I talk to an expert who shares wisdom that helps us be better coaches and better coaching business owners. This week I’ve got Nicola Grace on the show and she is talking to us about finding your life’s purpose. Now this is your deep soul purpose, but also it evolves into the purpose of your coaching business. So check us out on the other side. Benay: [00:00:33] Coach pep talk is proudly brought to you by Life Coach Office. Life Coach Office is a fabulous tool for one-on-one coaches. Now you may be meeting one-on-one with your clients over Skype or Zoom or you may be even meeting them face-to-face. Now what Life Coach Office can do for you is it can give you a place to store all of these extra resources that your clients can tap into when they are not in a one-on-one session with you. So what this does is it saves you heaps of time having to reteach the same stuff over and over again. What that does for you and your clients is while you’re meeting one-on-one, you can take your sessions even deeper and they become even more personalized. I’ve been using Life Coach Office like that in my coaching business for the last three…well ever since Life Coach Office went live in 2013 and it’s a fabulous tool for that and it saved me time from having to reteach the same things over and over because now I can just refer them to Life Coach Office. Check that out and then in sessions are like totally full on action-packed and we get straight to the juicy stuff. But don’t just take my word for it, Give Life Coach Office a try. You can try it for seven days for free. No credit card required. All you need is an e-mail address. Simply go to lifecoachoffice.com and I’ll put that link in the show notes. Benay: [00:02:08] We’ve got a fabulous episode ahead of us today so please grab a pen and paper because I’m sure we’re going to want to take plenty of notes. I’m very happy to introduce Nicola Grace to the show. Nicola has gone from cancer to making history saving a billion-dollar industry from ruin in New Zealand. She is also an award winning strategist and bestselling author. She helps social entrepreneurs clarify and monetize their mission so they can leave a legacy. Nicola’s intuitive visionary skills have made her the secret weapon to many and now it’s your turn too. Let’s check out what Nicola has to say on finding your life’s purpose. Benay: [00:02:52] Hello and welcome to the show. Nicola: [00:02:56] Hi everybody. It’s great to be here. Benay: [00:02:59] Thanks so much for coming on the show. I’m really excited to have you on the show for lots of different levels. You’ve got some unique gifts and talents that I haven’t had on the show before so I’m very curious to see what’s going to unfold. Okay. So we’ll just jump straight in to the juicy questions. So first of all I thought let’s kick off by exploring why you’ve honed in on helping people with mission and at the same time maybe address why this is so critical to the success of the coaching business specifically since we’ve got a majority of our listeners have coaching businesses, or they’re there to start one. Nicola: [00:03:40] Sure. And yeah I’m sure a lot of the listeners can actually relate to this. It was an evolutionary process, a process of evolution of my search for purpose. That the critical moment came when I had cancer twice. The first time I had cancer it was it was a morning where I realized that I actually had to pick the phone up and call my mum who was in a different country from me and say that I been given six months to live. And that was so devastating that it hadn’t hit me that I had cancer, but it hit me when I had to tell my mum. And the depths of the most devastating moment, that I thought that I could ever possibly experience I had this voice and this energy come out from my heart. Like it literally just popped out from my heart. And then I heard this voice that said, BUT I haven’t done what I came here to do yet. I don’t want to die. And it was I got that that was a communication from the little girl in me that came here to do something. And I realized in that moment, that I had a mission, which is beyond purpose. It’s part of your purpose but its bigger than your purpose. And we all have one. And then when I started working with an industry body, the natural health industry to beat that legislation and you know I managed to achieve in six months what they couldn’t do in 7 years. Everybody was saying you’re a woman on a mission, you’ve got mission mojo, this is your mojo. You know, this is what you’re here to do. And so this word mission came back into my mind again. And at this stage, I actually had cancer for the second time a different cancer, first time was leukemia, second time was melanoma. And I was still thinking, I haven’t done what I came here to do yet. And it’s that time that I focused on doing it and the biggest problem for me making a transition out of what I was doing was money. It’s like, “Well, can you actually make money on a mission to change the world, on a mission to create good in the world. Can you actually make money doing that?” And so the evolutionary process of discovering how to do that was what helped me put my mission together and when I and my business together. And when I had this big epiphany moment where I saw as an intuitive, working with a lot of people that they each had a mission and when you take that mission and you actually infuse it into the business that you have, or use it to create a new business more in alignment with your purpose, then there’s something really magical and magnetic that happens and things begin to flow, things began to unravel for you in a way that they don’t if you were an ordinary money driven business. And I went, “If I focus on helping people establish their businesses based on their mission to create that magnetism they’re going to create more change in the world. And more change that happens in the world the better off the world is going to be so I went that is worthy of my time and effort. And you ask the question, why is this important. And other than the fact that this is where our deepest fulfillment is from the rewards that we receive for contributing to the greater good, rewards we receive financially. It’s also becoming really necessary because we’re in a new market mentality, where this idea of social capitals really important. So if you’re not familiar with that ultimate trust parameter, they do surveys of global audiences and consumers every year and for the last few years since 2013 they started to see a sharp rise in this idea of purpose. A purpose to buy from this person versus a purpose to buy from that person being a critical part in the buying decision. And then in 2016, they reach so far as to say that, consumers now want to feel that they’re actually contributing to the greater good by buying from you, versus buying from somebody else. So it’s gone beyond purpose into is this exchange also helping save the environment, or helping starving children in Africa, or helping creating a better world. So that means that we now need to add something else in exchange with our prospective clients and customers called social capital in order to make sales, because now our trust barometer to see 50 percent of global audiences surveyed are using this desire to create good in the world as a reason to buy from one person versus another. Nicola: [00:08:56] No. That’s exactly what it is. Now the greatest social capital that you can offer someone is your mission, like the outcome of your mission. And this is where I differ with a lot of people out there teaching purpose. Like I teach purpose, this is the being, it’s like the being states that you’re here to achieve in your life and the being states you are here to help others achieve. Whereas chance is that what are you going to do that’s going to create a ripple effect that makes some kind of mark on the world. And everybody specifically coaches because we’re in charge of the transformation on the planet right now. I just got goosebumps all up my arms when I said that. Particularly for those of us that are in the service industries the biggest capital that we’re offering is the ripple effect of what it is that we change in the world, is its a result of what we do. So the majority of coaches that come to me when they’re looking at stepping up to a greater purpose within their work, because they know yes my purpose is to be a coach, but what of the nitty gritty details of that. I find that they don’t really fully understand those details, those finer distinctions about their purpose and their mission and really how they’re impacting the world. They just had this drive in this mission within them to help people. So when we know those details, what you’re going to see is that you’re actually creating some really being waves of change in the world that will affect one of the biggest problems that we have in the world that we need to solve. Yeah well yeah. Our mission, our life’s mission is not the same as our business missions, but our life mission is so much bigger than you think and it’s really important at this time, because this is a time that we’re all busy changing the world in a different direction from, you know here we are again on the brink of another nuclear war which we don’t want. Benay: [00:10:59] Okay I have I have a couple of clarification questions. You’ve mentioned a couple of terms and I just want to make sure that I understand and also that the listeners understand them. So you’ve mentioned the word purpose and mission and then mission splits and there’s a business mission and a life mission. Can you just add some clarification about each of those different levels so that people can under… start to understand and wrap their their minds around them? Nicola: [00:11:26] Yes sure they love to because this is what is interesting. You know how they say the devil is in the detail, the profit is in the distinction. So when we talk about purpose. Purpose is very broad. It is very broad. It’s going to include like I talked about the being states. So you can have life challenges and it’s your purpose to go through those challenges, overcome them and gain skills. That’s part of your purpose. You’re going to have things that happen that grow you and expand you, that’s part of your purpose. You’re going to have a drive to help people achieve a certain state in life, whether it’s clarity, or happy relationships or you know harmonious work-life. Whatever that being state is. That’s also part of your purpose. So you think of purpose as being something very general. And it’s all about being states. Mission is part of that purpose, but it’s the doing part. What you do to achieve those states. However, it goes a little bit further because if you look at right angles, it’s called precision. If you, here you are working with people to create these being states, now if you look at right angles, that 90-degree angle to see the ripple effect in what it is you’re doing, it’s making change in the world. And that is what a life mission is. So when you know directly what change you affect in the world and you know what your ripple effect is and then you infuse in your marketing and then your messaging and in your business mission, then you can create some magnetism. And you’re going to create a wow factor. So, let me just turn that off, I’m going I hear somebody and realized I hadn’t turned my phone off. So to give you a tangible example my life mission is to create conditions that will bring about peace on earth. So I’m a peacekeeper. And there are a lot of people in the coaching industry that peace keeper, or they’ll be global healers, or they might be freedom warriors, or eco warriors but there’s a whole lot of different problems in the world obviously. In that we are all here to solve but those are generally the main ones that coaches fall under when I do the work with them. So my life mission is to create the conditions that will bring about peace on earth, and I do that through my business mission, which is to help stimulate millions of businesses that are doing good in the world. Social businesses that are changing the environment, helping the environment, helping the planet, helping people, helping people become more prosperous across the board. So the more prosperous people are the more social businesses we have solving world problems the ripple effect of all of that is we’re going to create big waves of change. Does that make sense? Benay: [00:14:28] Got it. It fits so beautifully together. Nicola: [00:14:31] Yeah so the business mission is something you make up. It’s like yep this is what I’m doing. But the life mission is something you’re born with. It’s that little girl or that little boy inside of you that came here to do something and wants to stick around and get it achieved. And if you don’t do that, when you face, you know your life defining moments it leads to depression if you’re not doing it. Potentially even life illnesses, which is what happened with me. I was so far off track. I mean when you know that life mission. Now what we want to do is go, “Okay great. How does this fit into my business?” So now I can create a mission statement for my business that’s really wow, awesome, that’s got that sort of social capital in the…And it’s also got it that magnetism, because you know they say to people who are doing very well in business, you usually set say to them, “Well, you know your visions not big enough. Your goals not big enough. You’re playing too small.” So this is where you play really big, you play the biggest you possibly can. And consciously know you’re feeling the biggest change in the world. Benay: [00:15:40] And I’ve always found that too, that once I’ve become clear, like have that clear mission for myself. It’s like an underlying motivator or like a fire in your belly and it’s just like you just want to wake up and do your good work because you’re so committed. It’s just so much like a part of you. Nicola: [00:16:00] Absolutely. Absolutely. There’s a fire in the belly and even when things don’t work because you know sometimes, especially if you are building your business online. You’ll have days when nothing’s working, but you keep going because you have to get your message out there. You have to do this mission. So that so-and-so gets quiet in your mind. You don’t second guess what you’re doing you just go no I have to do whatever it takes to drive this thing to succeed because it’s not just about making money. You know, it’s about helping our planet, actually helping people out. Benay: [00:16:31] I’ve got to really it’s something that has just come up, a question for you around that. So with this like such an attachment to your to your mission and it being so much a part of you know what drives you and your fire in your belly. How can you separate that from ego? You know so that when you do fail or when something doesn’t go right you don’t like shred yourself apart. You know it like it’s you but it’s separate from you? Nicola: [00:16:56] That comes down to mindset. And you know Tony Robbins said it this, you know success is 20 percent strategy 80 percent psychology. So that comes down to having a psychology that there is no such thing as failure there is only feedback. 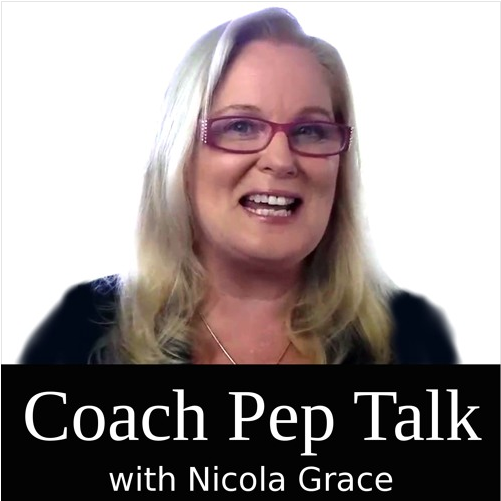 Nicola: [00:17:11] So and this is good for coaches because we are in the personal development world and this is what we would say to our clients. You know if at first you don’t succeed, have a look at what you needed to learn there, correct and keep going. But don’t quit. So take it as feedback not failure. It’s like, yeah, you just got feedback from the universe that somethings out of alignment. So listen to the feedback, make that correction, and keep going. Benay: [00:17:35] Yeah I love that. I love that. That’s one of the things I remember learning back in 2006 and my first life coaching intake weekend. That was a big huge quote for me, was it’s not failure it’s only feedback. It’s so powerful. Nicola: [00:17:51] Robert Kiyosaki he taught me that one, he was my first mentor. Benay: [00:17:55] He was probably one of mine. Rich Dad Poor Dad was a life changing book for me. I don’t think I finished all of it but you kind of don’t have to just need to learn the principles, anyway love him. Okay so I didn’t actually realize I’m pretty sure out of your categories that I’m a freedom warrior. I didn’t, I’m just mapping myself into your framework as we’re talking. Benay: [00:18:16] Yeah that’s kind of interesting. I had never really made that association. Nicola: [00:18:21] Yeah so you want to, you want to start using the word freedom in your marketing because this is the other thing, is like to create that magnetism. You know like I use peace. Peace of mind. I used the word peace a lot in my marketing. It’s like when you when you clarify what your precise mission is and all the details of your purpose and you get so totally aligned in your business. Things start to work really well and they start to flow. And then you’ve got peace of mind. You know everything’s working. So I use that word, peace, a lot. You want to use the word freedom. Freedom to do what you want. Freedom from emotional you know whatever. Benay: [00:19:03] It’s amazing. I can, I can… Yeah I look forward to exploring that. I could see all this potential just standing in front of me, but I gotta focus on this wonderful interview. Let’s get back to missions and I guess you’ve kind of already touched on it. Is there anything else you want to say about what makes a good, a great mission when you’ve got a coaching business and also how you know when you’ve got it right? Nicola: [00:19:34] Tears helps a lot. T E A R S.
Nicola: [00:19:36] Like even if you’re a guy like this, when the penny, I’ve got a soul searching and self-discovery process and I take people through so they go deep deep deep down into their heart, deep deep into their souls, to find out the answers. And the moment the penny drops, there is usually silence because something bigger starts to slip in and you are in awe of that moment and you’re rendered speechless. And this goes back to it how do you know it’s not your ego. What’s the difference there. And then I’ll have people who will e-mail me saying, “Oh my goodness I’m getting so much out of this very first process that they want to stay with it because I want to milk it for as long as they can. Because you’re getting in touch with their soul and they’ll be saying, “I’ve been crying for the last hour.” Tears of joy, so it’s not sadness, it’s not a bad thing. But it’s tears of joy from finally recognizing why you’re here. And that you’re actually being communicated to all the time on why you’re here. Benay: [00:20:53] Wow. O.K. I think that’s a pretty solid answer. Thank You. Nicola: [00:20:58] Not what you would have been expecting. Benay: [00:21:01] Yeah, well I love that it actually is that clear. And when you know you just you just know. OK, given that, do, can missions change over time? Nicola: [00:21:14] No no they can’t. But you have mission milestones and that’s a really good question. Because people will often, you know especially coaches, if you’ve been coaching for a while and all of a sudden you won’t feel connected to your purpose anymore or you’ve lost flavor, or it’s just not exciting to you anymore and you’ll go, maybe I was never on my purpose in the first place and I’m off of purpose. And it’s like, No, you weren’t you just have a higher level to go, you’ve got new work to come to. So these are the next mission milestone. So you have milestones within your mission, but the theme of the ripple effect that your affecting, does not change. And to give you an example, I’ve been a peacemaker all my life. I’m the one that holds the harmony in the family. I’m the one in relationships that always tries to make peace at all costs. So I obviously become a very good communicator. And I’m the person that when I was at school, I’m originally from New Zealand, lived in Australia when I was at university… Rather it was my university that started all the massive protesting of nuclear warships in Auckland Harbor to eventually make New Zealand Nuclear Free. So there’s that theme of peace again. And I’ve done lots of lots of volunteer work that is moving towards peace. And then I spent some time in an ashram to find peace within me. You want peace in the world, you’ve first got to start with yourself. So there’s that feeling of peace. And then now that I’ve gone to into mentoring and I’m seeing the ripple effect to all my clients work, you know helping me create those conditions for peace on earth, that has never changed from the time I was born. And so, whatever the I theme is of, you know, the problem of the souls in the world. And the mission, I call it the mission mojo avatar, well what is the avatar of who you are in the world and how are you supposed to show up, that never changes, but the format may change. The mission milestone will progress. Benay: [00:23:29] Could you give us an example of a real mission milestone? Maybe that you’ve faced or one of your clients? It doesn’t matter, just so we can grasp that? Nicola: [00:23:37] Yeah well why that…working with the natural health industry was very definitely a milestone for me. I basically, what happened is that New Zealand and Australia were talking, you know the governments were talking about forming a corporation that was going to be funded and run by the pharmaceutical industry to regulate natural health products and themselves without government scrutiny or people’s scrutiny. So we all know that can be done so that that was passing through New Zealand and Australia parliament over the course of seven years and the strategy they were using wasn’t working. And then I just came on board through my naturopath actually, and I was in my naturopath’s office talking about my diagnosis of stage four melanoma. And I got an interview, not an interview, an opportunity to talk to the industry body that was fighting the legislation to say I’ve got a strategy. Have you done this, have you done that, they hadn’t done anything that they needed to do to beat that strategy and basically I wrote out a strategy that, you know, that came to me as in a vision that I had, as well as my experience working with making New Zealand nuclear free. Put that together, we rolled it out within six months. We you know we defeated that legislation and got thrown out of parliament. So that was a milestone. Now the next milestone was creating a thousand businesses in the social entrepreneurship field creating good in the world. So I have now done that, I’ve helped out over a thousand business owners re-engineer their business model, so that it is in alignment with their higher purpose and their life’s mission and get that social greatness happening in the ripple effect what it is their doing. And then there’ll be another milestone. Who knows. I mean I’ve got a Hollywood producer has asked me to write a book about what I did because he thinks it’s going to be the next Erin Brockovich movie. So that’s probably going to be another milestone for me. So can you see how the forms of what I’m doing are changing but the theme is the same. Benay: [00:25:52] Yeah. And when those forums change once you reach each milestone. Are you. Are you feeling like there is a transition phase in between one and the other? Benay: [00:26:07] And what does that feel like from your perspective see you know other coaches who might be in that transition moment can maybe learn from you. Remain strong. Nicola: [00:26:19] Yeah yeah yeah yeah well yeah again not the answer your expecting. It’s scary. Like it’s scary because all of a sudden it’s black out there when you look in front of you. Because you go, well hang on a second, if I’m not doing what I’m doing now what am I gonna do? And you don’t always get shown the cliff that you’re going to leap to. You just see the big cavern, right? So what do you do. Yeah. For sure. Stay strong. But I would I would say first stay vigilant to observing what you’re thinking and what clues are coming in around you. How the universe is showing up for you to guide you and lead you and just be open to listen and know that it’s probably going to take maybe two years, maybe six months, who knows. but it’s going to take time for the transition to actually occur. Benay: [00:27:12] Okay. And then let it unfold kind of. Nicola: [00:27:14] Let it unfold. But don’t just walk away and let it unfold. Take time to strategically get quiet and listen. And you know working with somebody is always good and this is one of the reasons why I really love the program that I teach because I’ve got that soul searching module at the very beginning where you look at what is your template for your mission. And I when I did mine I could see into the future that eventually I would be making a movie about my story, and it, and I would be helping out you know sort of shift things at the political level. But I had a way to go to get there. So I could actually see further into the future. But I also knew what I knew what was in front of me, what my mission milestone was. So I could just focus on that and not get too concerned about what was down the pipeline. Benay: [00:28:08] It must be pretty nice to have the insight to know what’s waiting for you in the future. Nicola: [00:28:14] You know it’s good and my clients feed that back to me, they say that again, peace. They feel a sense of peace that they’ve got longevity in their life. first of all, right. They can see the bigger picture of their life and how it’s all working and how it’s all fitting in. It’s not, they’re not just looking at the things that’s right in front of them. That’s what they’re focusing on. They can actually see the other things coming in as well too. Benay: [00:28:43] That’s great. I think that really has clarified the mission milestones concepts so thank you. I guess when when is the right time to write a mission statement or revisit your mission? Nicola: [00:29:00] Very good question. Oh the best time to write a mission statement is when you know what your life’s mission is, because any other mission statement that you make up from there is going to be made up. And it can work for you. But less and less these days. It needs that added element, it needs that extra piece needs that, you know, that extra piece of magnetism and connection. Because congruence and especially for coaches, I want you to hear this, congruence is the single most important thing you need to be focusing on right now as a coach because trust in coaches, especially buying programs online and workshops and what have you, is at an all-time low. And the number of coaches that are out there doing these things is at an all-time high, with more and more professionals and seasoned entrepreneurs coming into the coaching industry every week. So your competitive edge is going to be your congruency with who you really are, how you really supposed to be showing up in the world, what you’re really supposed to be doing, and how you actually deliver those, you know those services and those products and programs in a way that’s very authentic to and you could be yourself. Because people are craving all the authentic because they’re being ripped off by these big flashy programs and flashy coaches that haven’t delivered. So that’s good that you know that’s a good thing and a bad thing obviously but the good news for most of us who you know who aren’t the big flashy you know multimillion dollar coaches charging 100000 dollars for a coaching practice program. We we’ve got the authenticity and that’s that’s our competitive edge. So the congruency comes in your mission statement from really knowing all of those elements of your purpose in your mission infused into your statement. So I would do that work first and then create the mission statement. And how often should you revisit it. Every single time you see something else you should be doing or not doing because that means there’s an activation happening for your next mission milestone. Benay: [00:31:22] Can you say that again it was a bit fast; I didn’t catch it. And I think it was really important. Nicola: [00:31:30] When you are feeling like there is something else you should be doing. That’s an indication that the next mission milestone or a higher purpose to work is beginning to get activated. Benay: [00:31:43] Oh man, I’ve reached that point so many times. Nicola: [00:31:45] Yeah exactly. And you’re not off purpose, it’s just there’s some expansion that needs to happen. Nicola: [00:32:00] Yeah yeah yeah yeah I have that too. Benay: [00:32:03] Like three posts and I’m like man this is boring, I miss my business. It’s so much more fulfilling. Nicola: [00:32:11] Well that’s an indication that any work life balance, isn’t it? It can’t be all about giving out, giving out, giving out. This is what coaches do to the point and often they’ll do a lot of pro bono work and I guess that it doesn’t work. You know you’ve got you’ve got to have that lovely even flow of giving and receiving for you to continue. Benay: [00:32:31] Yes and this year for me is all about self-care. I’m running out my body and my everything yeah okay. Wow okay. So I think that we kind of talked about this in a way in the beginning, but you know for the coaches who were like totally eating up everything you’re saying was I’m doing. If they want to get started on their mission how or where. Where do you start? Nicola: [00:32:57] Well the first place to start is doing my free course. It doesn’t cost anything and it gives you the big picture overview of purpose and how to monetize it within your business. Cause mission driven businesses need a different business model. As we’ve discussed they need to have social capital as part of their exchange. So you’re a coach that’s been doing a lot of these coaching programs to teach you how to build clients doing teleseminars. Or how to build clients doing Facebook advertising. Or How to get more clients doing this, that, and the other thing. And then you’ve been getting underwhelming results. That’s an indication that you’re actually not in alignment with your purpose in your marketing. So I talk a lot about that in the free course, so that’s the first place to go. It’s like you know if you don’t resonate with me, go find somebody else that got something that can get you started because you need to do the soul searching self-discovery work. You just can’t skip over it. There’s no way around it, there’s no way out of it. And if you try to move forward when your souls really calling you to do that work, what happens is you start to manifest life disasters, like me one time other than cancer. I couldn’t move so I’m lying on my back for six weeks having to do the soul searching work. You get forced to do the soul searching work. You know your relationship crashes or something bad happens and all of a sudden you’re forced inward. You forced to do the reflective work. So don’t wait until its forced upon you. Do it as soon as you start hearing a calling that there’s something else for you to do. Benay: [00:34:31] Ok and will provide links to that in the show notes everybody, so you can hop on and sign up for that free course. Okay. If there is one thing you could get the coach listeners to do as a result of having listened to this episode today what would that be? Nicola: [00:34:50] Oh this is my favorite one. So sit down and write everything you’re thinking that you’re second guessing yourself. Nicola: [00:35:07] Anything that your second guessing. Everything that other people are telling you you should do. Or a repetitive thing that’s coming at you, signs that you’ve got. Because in of all of that are the clues as to what your next step is. Benay: [00:35:23] Okay. What do you do with that list once you’re done? Nicola: [00:35:26] You look at it. And you start examining the patterns and the clothes and you go, “What’s it telling me?” Mean for most people it’s actually really obvious. Nicola: [00:35:36] It’s really it’s really obvious. Benay: [00:35:38] Okay that’s a wonderful okay. I love that. I love how when we can end on a really actionable clear thing that people can just like hop away and grab a coffee and do straight away. So that’s awesome. Nicola: [00:35:48] Yeah exactly. Yeah. So so here’s here’s an example of that. I’ve got a lot of clients that are doing my Writing Mission Right Money program and they were, that’s my social entrepreneur training program that they do with coaches to get their alignment right, and I’ll get emails or when were on our live calls saying they’ll talk to me that saying, I don’t know why everyone in the world isn’t doing this. And I hear it so many times. So that’s a clue for me. It’s time for me to actually start expanding and reach more people. So if your hearing something from your clients over and over again, or you are hearing signs or seeing signs things, it’s time to listen, start taking some action on it. Benay: [00:36:31] So what is the next step for you, for your expansion? Or is that top secret. Nicola: [00:36:37] No it’s not. The next step for me is actually to speak more. So I’m going to be starting my own live telecast on YouTube and Facebook. Benay: [00:36:48] And if we sign up for your free course will we get notified about that? Nicola: [00:36:52] You’ll be in the loop. Yeah really. Benay: [00:36:54] Okay. Excellent. Nicola it’s been awesome to have you on the show. Thank you so much for your time today. Nicola: [00:37:00] Your welcome. It’s been great. Thanks everybody. And those of you listening I’m Looking forward to getting to learn more about you when you take my free course. Benay: [00:37:09] I’m sure you’ll have a lot of people taking you up on that. Myself included. All right. So thank you listeners and please do us a favor by going and liking the show on iTunes. Have a great day everyone. And happy coaching. I loved this podcast with Nicola Grace! Great tool for us as coaches to help us create and discover mission and purpose in our lives and work. You seem so relatable and friendly. Your voice is so clear and professional. You would make a great voice in acting or commercials or hosting events, if you don’t do that already. Thank you for all you do to help us coaches be better! You rock and I have certainly been blessed by you. This is an amazing podcast. I am finishing a transitional period. After working as a nurse and short-term medical missionary for years, I see where the two can be combined to help alleviate sickness and disease by how we do missions. Transitional periods in our life are so powerful Marie. Great you’re answering your calling into a higher level of your purpose and mission.